In my dream, I’m walking on a trail by the river Thames in London, ON, near the neighbourhood where I grew up. I enter the ravine, moving into the woods, and find myself at place I know well where the river bends. The current’s powerful here, and on the opposite bank rises a sandy cliff full of swallows’ nests. I swim across, emerging on a ribbon of sand at the cliff’s base. Suddenly, I’m naked. I roll in the sand vigorously, really getting it into my skin and hair. Then I lie back, waiting. A rope or belt, interwoven with shells, comes up from the ground and hooks me by the neck, hard. I resist briefly, instinctively, then surrender, and am pulled into the earth. It’s utterly dark, and for a while I see and feel nothing but the rope now loosely about me. Then a place appears, dimly in the distance: a small beach against a rock face with a cave opening there and a little fire burning before it. It’s night. I come and sit by the fire. I can sense water close by, though can see nothing but my immediate surroundings and stars overhead. The white sand is fine and cool. All is still. I feel like I’m in a spirit world, or our world long ago. I lie down, thinking to sleep. A crab emerges from the sand and crawls onto me. Though briefly unnerved, I accept it. Then many crabs emerge. They crawl all over me—and they begin to eat me. This happens fast and slow. My awareness is focused on them: their eyes glinting in the moonlight, their delicate legs, their smooth hard backs and strange claws. I’m a floating awareness now; I’ve become food to nourish them. They eat neatly, until everything is gone and only my clothing and bones remain. All of this feels utterly holy: a great, spiritual event. The crabs disperse, some toward the unseen water and some nearer to the cave, where they lay eggs in the sand. Disembodied, I observe, aware that I ‘am’ the crabs now and that I’m making possible the next generation of crabs. This feels totally right. I find myself crossing the Thames River again—but the I who emerges on shore is not the same person. I feel distinctively other. I’m barefoot now, and wearing a long blue dress interwoven with shells, with shells adorning my hair. I feel beautiful. What does it mean to be devoured? According to the dream, it means offering oneself fully to the needs of others—in this case, earth and spirit. Doing so ensures there’s a future. Doing so brings to life the shelled one, the beautiful barefooted woman in blue. All of us learn early on in this culture that humans occupy the top of the food chain. We choose what we eat. We call the shots! And do we ever do that: we eat and eat, and regard those who dare nibble us or our food as vermin. In this dream, however, there is no ‘top,’ only the cycle of life and spiritual transformation. It’s time to give our old identities over. We must act—and the action required is to stop: stop interfering, stop controlling, stop thinking we know best. Be naked, and surrender. Trust that Earth, which has created us, knows what to do. Crab will take it from there. Crabs are scavengers and meticulous cleaners. Sensitive and tough. They operate on land and water. What better creature to consume our tainted selves, and create new life? Our sacred task now is to dissolve pride of ‘first place’ and lordship, to give over our old identities on behalf of the law of creation. Can we trust this earth? How can we not? The best of who we are can feed the future of all beings. This is the path to becoming earth-human, spirit-human—integrated human beings. Then there will be a future. 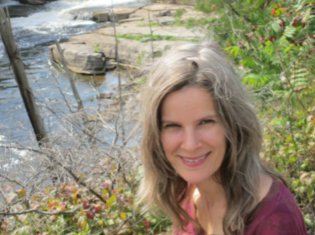 Sharon English has published two collections of short stories, Uncomfortably Numb and Zero Gravity, which was long-listed for the Giller Prize. Her new novel, What Has Night To Do With Sleep? attempts to find convincing ways to evoke the earth, its non-human creatures and the cosmos as conscious agents in life. She's currently the director of the Writing and Rhetoric Program at the University of Toronto, where she teaches creative writing.